Hello everyone! We’re very pleased to welcome ♥ Rachel ♥ back to the blog to share her bookish adventures in the field. The last time she was here, she gave us fascinating movie news from our favorite Harper Teen authors. Today she’s dishing on exciting book news and even writing tips from Scholastic authors! What happens when you bring together authors Maggie Stiefvater, Libba Bray, Siobhan Vivian, Pete Hautman, and David Levithan? A night of crazy, zany, hilarity! The event I attended was held at the charming independent bookstore, Mrs. Nelson’s Toy and Book Shop in LaVerne, California and was a packed full of excited fans! This is Teen LIVE! is an author tour in conjunction with Scholastic’s new site thisisteen.com. David Levithan not only moderated the panel, but he is also apparently the editor behind these authors’ books. His knowledge and friendship with them was obvious, as evidenced by rapid-fire jokes that were flying. It was a great opportunity to get a glimpse into the quirky mind behind one of the Wills from Will Grayson, Will Grayson. He is FUNNY! 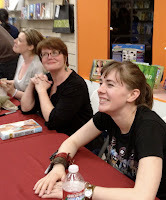 I had a chance to talk to Maggie Stiefvater a little before the event, and thought she was completely entertaining. Maggie said the follow-up to her fairy novels, Lament and Ballad, was just turned into Levithan for editing and should be out sometime next year. I know that’s a long time but don’t be sad–her first book in The Raven Cycle, a four-book series, will be out September this year! You can even read the first two chapters online while you wait. I’ve never read any of Libba or Siobhan’s work but after listening to and meeting them, I’ve made it my goal to change that. Libba Bray is laugh-out-loud hilarious! Her southern accent and inflection was flawless as she read from Beauty Queens. Siobhan Vivian also had me entranced by her lovely voice while she read from her book The List. She told us her inspiration for the story was a male friend in school, who was nominated as Homecoming King–not because of his popularity, but because his classmates thought it would be funny to nominate a loser as a joke. The List stemmed from Siobhan’s ideas about the perceptions of beauty and popularity that are held in school and society, as well as how it affects us. I was excited to hear Siobhan has a new trilogy in collaboration with her best friend and author Jenny Han. The first book in the series comes out in September of this year, and is entitled Burn for Burn. Pete Hautman talked about his book, What Boys Really Want, which partially involves an advice column blog with a teenage girl doling out answers. He read out some of the question and answers that had the audience rolling with laughter. Very funny, funny man! I bought the book straight after. Incidentally, three of the five authors at the signing, Stiefvater, Bray and Hautman, were up for The Los Angeles Times Book Prize, and ended up winning for his book The Big Crunch! At these signings, there is inevitably always a question from the audience about tips for writing. In this case it was a teen who asked for some suggestions on dealing with writers block. Maggie said her block was always because she didn’t know where the story was going. Her rule is never start writing a book until she knows the end of it. She now always has the last scene in mind, so she knows what to work toward. Pete’s advice: Don’t be afraid to write something bad, maybe you need to get it out before you can move on. David said it helps him to talk it out with another person. A lot of times they don’t even have to say much and you end up working it out just by telling them. At the end of the event, we also found out there was a surprise member in the audience: John Corey Whaley, this year’s winner of the Michael L. Printz award for his novel Where Things Come Back! If you haven’t read his awesome essay on why he reads young adult literature, check it out here. I had such a blast at this event and I want to thank Wendy again for inviting me to share my experience! 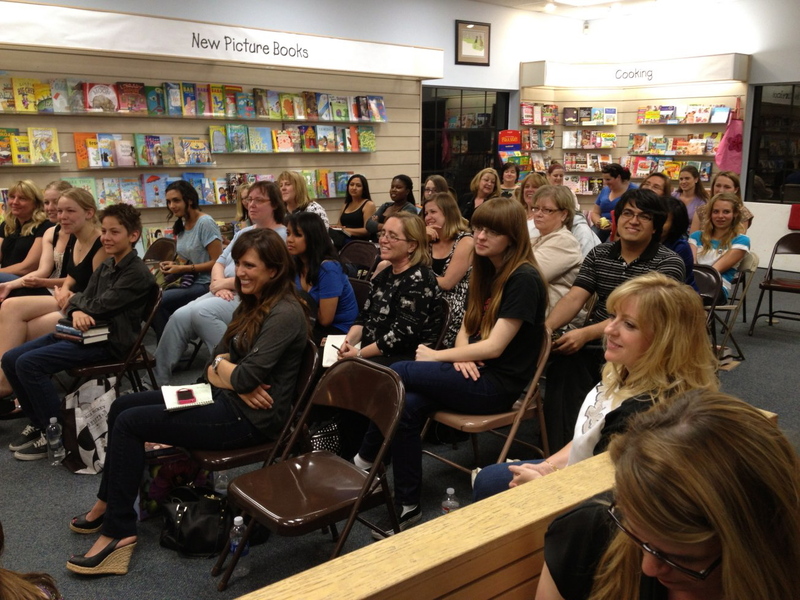 I wish all of you readers could be there with me too! Great post Rachel! I would have love to attend this! So jealous! I love the pictures! And wow about the inspiration for the book The List. I definitely need to read it. Aw, this events seem like so much fun! David Levithan seems to be a quite popular editor, ha. I had no idea that David Levithan was also an editor. What a talented man! Thanks for sharing, Rachel! I can’t wait to read about the LA Times Festival of Books. What fun! I love meeting authors. Another great event recap! 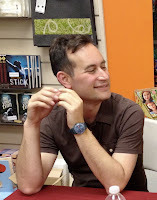 What an all star line up of authors – I’d love to meet David Levithan sometime. And I had no idea Stiefvater had another fae book in the works. Really looking forward to reading Burn for Burn too. Thanks for sharing your experience, Rachel! Thank you readingdate! David Levithan’s charismatic personality was a surprise to me but I guess it shouldn’t be. It comes through when reading his work as well. He was so witty as one of the Wills in Will Grayson, Will Grayson. Hi Rachel! Thanks for sharing this fun event with all of us. 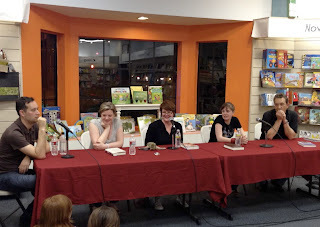 Sounds like you had a blast meeting all these wonderful authors. Wish I could have been there but at least I got to read your post. This sounds FANTASTIC. I adore Maggie and Libba, and the rest of these guys sound ridiculously awesome (which, really, is no surprise). I’ve made it my goal in life to attend more author signings. So exciting! Thanks for sharing, Rachel. I’m glad to hear that Maggie didn’t abandon her fae series. I loved that one! I can’t wait to read Siobhan’s books now. She was super sweet. Great post, Rachel! This sounds like such a fun event with so many excellent authors! I’m looking forward to Maggie’s new books and I just got a copy of The List, can’t wait to read it!